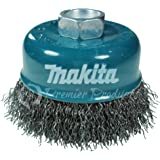 Amazon's Choice for "makita grinder 4 1/2"
Sold by Premier Products, Limited and ships from Amazon Fulfillment. 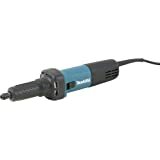 Ships from and sold by PROFESSIONAL TOOL CENTER. 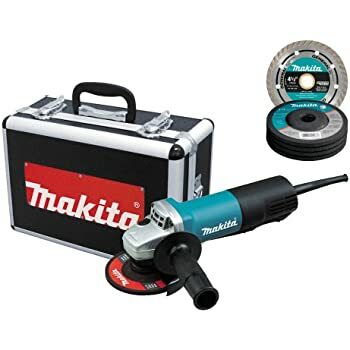 Metabo WEV15-125 HT Lock-On 13.5 Amp 2,800-9,600 rpm Angle Grinder with Electronics and High Torque, 4.5"/5"
Warranty Offer: Select Makita power tools shipped from and sold by Amazon.com are covered by a one-year manufacturer's limited warranty. 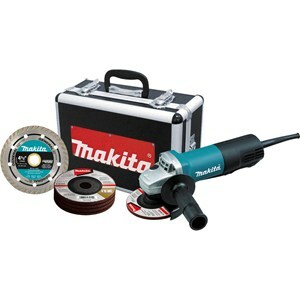 Please see the full Makita warranty for more details. Ease-of-use features include an extra large paddle switch for comfortable operation, and a lock-on/off feature for continuous operation. The 9557PB weighs only 4.5 lbs., with a side handle that can be easily installed on either side of the tool. In addition, the 'tool-less' wheel guard adjustment provides easy clamping. 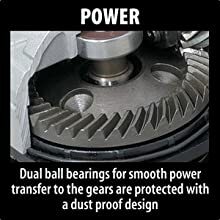 This grinder also has an AC/DC switch for use with alternative-power sources. 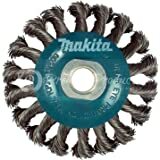 The 9557PB is a versatile and powerful grinder engineered for cutting, grinding and polishing applications. 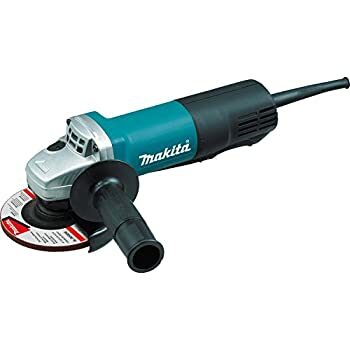 This powerful 7.5 Amp Makita angle grinder has an exclusive labyrinth construction that seals the motor and bearing from contamination.The 9557NBX features a switch (AC/DC) that is conveniently located on the top of the motor housing and a small circumference barrel grip for easy handling. 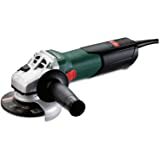 4-1/2" Angle Grinder AC/DC, 7.5A Motor For Heavy Professional Grinding Applications, Spindle Lock For Easy Wheel Changes, Small Circumference Barrel Grip For Easy Handling, Side Handle Can Be Installed On Either Side Of Tool For Operator Convenience, Switch Is Located On Side Of The Motor Housing; Lock-On Feature, Grinder Includes: 4-1/2" Grinding Wheels, Side Handle & Wheel Guard, Includes Extra Diamond Wheel and carry case. 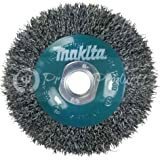 5.0 out of 5 starsMakita 9557PBX1 (4.5", 7.5A, 10,000 RPM) - Great Grinder. Great Value. Great Case. I wanted to clear up the confusion as to what exactly is included. plus owner's manual and the case of course. The case is aluminum with zinc coated hardware and latches. They should rust in no time. I spray nuts and bolts on floor jack and other zinc hardware to not rust, but I don't want to lube up these latches - I'd never be able to open the case. Oh well - better than a cardboard box. 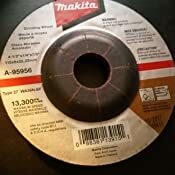 The case has eggcrate foam on the lid and tougher rubberized foam with cut outs for the tools and individual cutouts for each disc. Great protection for fragile wheels. Another thing I like is that the lid does not fully open. It goes a little past vertical and stops preventing damage to lid after a thousand times of throwing the lid open and it hitting the floor. This is my first Makita (M*lwaukee and R*dgid fan-boy here). 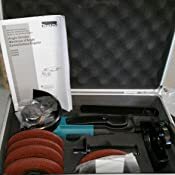 It's a great value and works great. It ate through a Br*nks R70 disc-lock without blinking. Its small size allowed me to maneuver behind the weirdly shaped lock (enclosed hasp) butted up against a corner and melt through the lock one-handed. 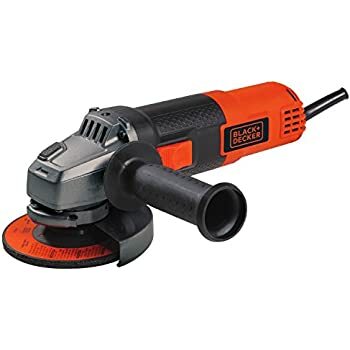 I have a 7-inch R*dg*d angle grinder that has waaay more power and lethality, but simply would not have been able to complete this job due to it's size. Another testament to having the right tool for the job. In this case, smaller is better. I'll admit it doesn't have the power of the big boys, but i'm not cutting through foundation or 2" plate. I'm also not melting extension cords or flipping breakers every few minutes. 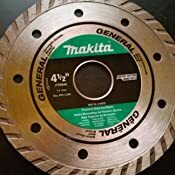 The included grinding wheels can handle mild steel as well as stainless and hold up way better than the Horrible Freight discs. 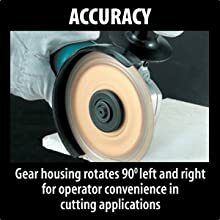 Included discs must be precision balanced because the tool runs so smooth with these. 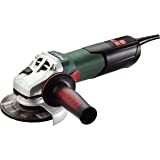 The brand-new grinder and small diameter probably has something to do with that. It has paddle-switch operation (dead-man's) with lock-off and it can lock-on with a push button near base of paddle. Nice feature. 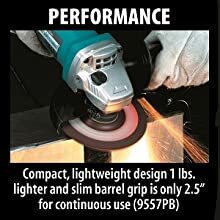 Overall this grinder is definitely another great addition to my toolbox and wish I had it sooner. I might buy another one. 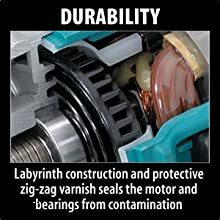 It's a great tool and I would expect nothing less than the best from an industry leader in tool manufacturing. I haven't switched teams from M*lwaukee yet, but this little gem has definitely grabbed my attention. P.S. Wear a face shield if you like your vision. Safety glasses alone won't cut it. Wear both. With gloves and long sleeves. 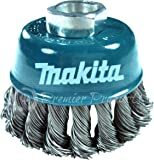 5.0 out of 5 starsThis Is My New Favorite Tool! This thing is the bomb! 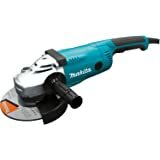 I'm a woman who has a decent set of power tools but this is a new one for me... and it's already proven to be a fantastic addition to my toolbox. I recently bought a house and we are having a bunch of renovations done. I made it clear to my builder that I want to put in some sweat equity so he put me to work pulling up the tile and prepping the floor so he could put the wood floor down. 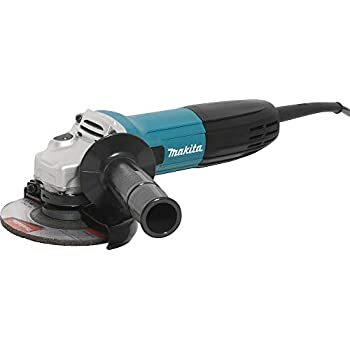 After beating heck out of the floor for an hour I went to my phone and searched for "How to remove Thinset from a sub-floor" and came upon a video that showed a guy using one of these things along with a Diamond Grinding Wheel and a Dust Collector Hood. So I immediately ordered all 3 and waited eagerly for it to arrive. Assembly was reasonably easy... it's a little fiddly at first to hold down the lock pin while removing or adding a wheel, but otherwise it's pretty straight-forward. The dust shield was a little challenging to get on as well but I think both will get easier as I get used to using them. By the way, the dust shield is a definite necessity if you are doing anything dusty.... I wouldn't work without it now. 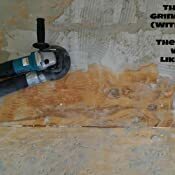 I'm adding photos of the floor from when I started as well as one of the finished floor.... some of the thinset just would not come off with any beating with a hammer ... so I did a combination of knocking the loose stuff with the hammer than finishing with the grinder. The only thing I wish I had known (unrelated to this grinder) was that the expelling chute was a LOT smaller than the hose end on my shop-vac - thank heavens for Duct Tape!!!! I'll have to get an adapter for future use .... oh - and the dust clogged the shop vac filter so I had to clean it off several times... but none of that is the fault of the grinder or dust hood. The bonus was that we had a wall that had nails sticking through it and we just pulled out the grinder and changed wheels and ground them right off... so this thing is doing a great job earning it's keep already! I have another floor to do in the bathroom and having this makes it FAR less daunting to look forward to! 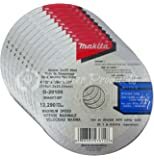 I had a hard time deciding whether I needed this and as a result spent a lot of time here and at Home Depot researching this. That's about it. 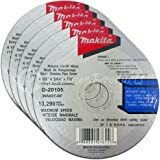 The closest competitors that I saw were the milwaikee 6130-33 and Dewalt D28110. Both of these have locking thumb switches. I thought milwaukee's switch is too small and flimsy feeling but I like the easily adjustable guard. The Dewalt has a larger and sturdier feeling switch but is heavier for a 7 Amp grinder at 4.1lbs. 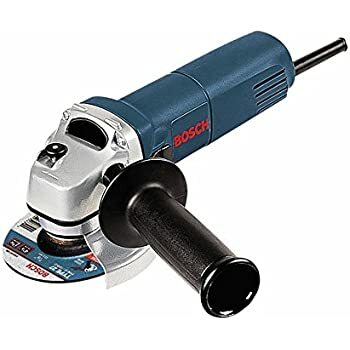 This tool has what I think is the ideal switch for a grinder - paddle switch. It runs the entire length of the tool so it doesn't limit how you can hold it but means that anytime you let go the tool is going to stop. It has a small latch, positioned in the middle that must be flipped before the paddle switch turns the tool on. This becomes natural after a few uses and prevents the tool from coming on accidentally when you put it down. Thumb switches by contrast, either require you to hold the tool in a very specific way, or force you to reach for the switch to turn it off. For a hand tool this powerful that's not ideal. 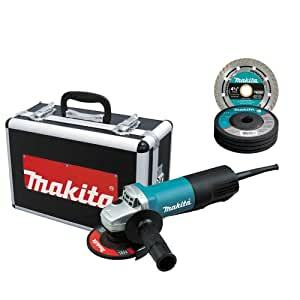 So far I've only used it once to help a friend with rust on his car but given Makita's solid reputation (close or equal to Dewalt/Milwaukee) I expect this tool to last for a long time. On top of that of course, it includes a great case, 5 grinding disks and the diamond cutter. 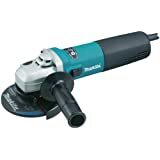 All round I think this is the best angle grinder out there.